3b. 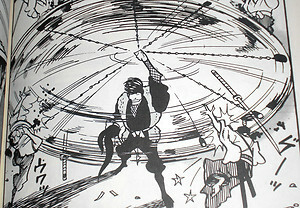 Shirato Sanpei – Ninja Bugeichō pt. 1 | What is Manga? 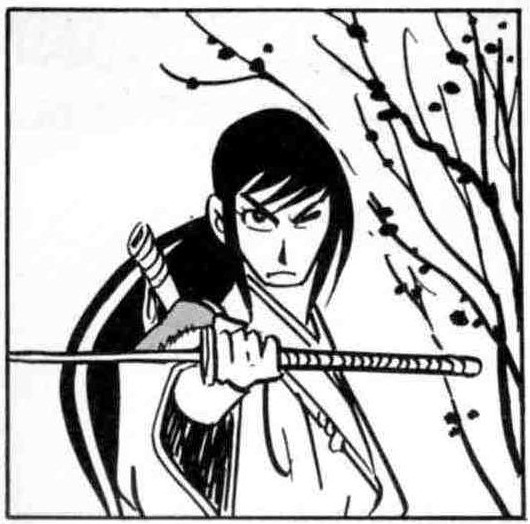 Anything I might have to say about Ninja bugeichō Kagemaru-den (Manual of Ninja Arts: Legend of Kagemaru, hereafter NB) is going to be perfunctory and provisional, beyond this: it is my favorite comic. Full Stop. It is hands down the best thing I have ever read, so it is quite difficult for me to resist my fanboy impulse to simply fawn over it in 1500 words. I will try to limit myself today to a brief discussion of Shirato’s entree into manga in addition to an exposition of two important and indicative male characters, Kagemaru and Jūtarō, before turning to Akemi and Hotarubi, two arguably more indicative female characters, next time. Kagemaru’s master takes “his” head. Shirato’s “whatever” attitude toward manga certainly does not reflect the fanatical devotion to the form that one normally expects and does a great deal to conceal his own manga lineage. Shirato was born Okamoto Noboru, and his father, Okamoto Tōki, was a proletarian artist who had done illustration work for Tokyo Puck, the current affairs/humor magazine founded by Kitazawa Rakuten. He worked extensively as a kamishibai artist, as noted above, and was an assistant to Yamakawa Sōji, the famous emonogatari author/artist. It feels odd to note that people like Rakuten and Yamakawa are titans of manga history, and yet the necessity exists because their presence in Japanese manga historiography is uneasy at best and nonexistent outside of Japanese language discourses. This is oddly appropriate for Shirato, then, virtually unknown outside Japan (with a few exceptions) and yet one of the most recognized and influential within. If you’ve ever read Naruto, you’ve basically read a dumbed down version of Shirato’s Sasuke. As I’ve tried to argue in a recent paper, the specter of Tezuka looms large over manga history and not necessarily for good. As a result, his weird criteria for who does and does not qualify as a manga artist–draws with a pen and not a brush, doesn’t work for newspapers, text only in images, etc.–have been used again and again to, oddly, exclude many figures who were foundational in manga’s early history, especially Okamoto Ippei and Kitazawa Rakuten. If one aspires to manga supremacy, you must first bow at Tezuka’s altar, then you can go on to do whatever you want. Shirato never seemed to give a crap about the burgeoning manga truisms of the late ’50s, and perhaps to his benefit. He has however, been subject to a revisionist diminishing. Tatsumi Yoshihiro‘s memoir Gekiga hyōryū (A Drifting Life) is admirable for telling the history of postwar manga from an insider perspective but regrettable for its deafening silence about Shirato, especially when it does more than a little of the work of sustaining the “god of manga’s” deification. I would rather understand ikki as solidarity, with all of the contemporary baggage that word carries, for part of what NB does is use the liminal status of the ninja to upend the top-down assumptions that histories of feudal Japan, and of the sengoku period in particular, are so rife with. No one is more indicative of this liminal status than Kagemaru, the ersatz “hero” of the story, who is the successor (deshi) to an illegitimate line of the shinkage-ryū. The legitimate line answers to Nobunaga, so Kagemaru’s (and his master, Mufū Dōjin’s) antagonizing them is one and the same with the peasant revolts Kagemaru and his band, the Kage ichizoku, direct against Nobunaga and his allies. Kagemaru understands (or at least seems to understand) himself as in solidarity with the dregs of feudal society, or least in opposition to the warlords whose grand schemes always seem to result in rampant destruction and increased hardship for the underclasses for whom they have little if any concern. So, a facile reading of NB as social realist melodrama works well enough, but ignores the fact that Kagemaru’s solidarity with those oppressed by the feudal system is not entirely perfect. As NB opens, Jūtarō has recently been placed in captivity after his father, the former master of Fushikage Castle has been supplanted by (read: killed by) Sakagami Shuzen, who will be a thorn in Jūtarō and Kagemaru’s side until the very end. Jūtarō sneaks back into the castle to get his revenge on Shuzen only to discover “him” lying dead in his bed. He turns to see Kagemaru and is furious with him for killing his only chance for revenge. Kagemaru explains that he only killed Shuzen’s kagemusha (shadow warrior), his stand-in, thus beginning a common theme throughout the text, the necessity of deceit, to deceive not only others but oneself. Jūtarō’s own self-delusion leaves him wandering aimlessly in the final volume. Though, Jūtarō seeks not only to revenge his father but restore himself as the rightful master of Fushikage Castle. Kagemaru sympathizes with his desire to kill Shuzen and protects him. When Hotarubi, Shuzen’s sister, cuts off Jūtarō’s arm and is about to kill him, Kagemaru intervenes and takes Hotarubi’s arm in return. However, Kagemaru’s interests, to turn the entire feudal system against itself, goes directly against Jūtarō’s desire to restore his status. When Kagemaru, Jūtarō, and their hastily assembled band assault Fushikage Castle, Jūtarō chases after the escaping Shuzen, and Kagemaru uses the opportunity to raze Fushikage Castle to the ground. Though he feels a sense of solidarity with Jūtarō and how he has been profoundly wronged by the nature of the society he lives in, Jūtarō is a natural casualty of Kagemaru’s populist ambitions. From that point on, Kagemaru has to conceal himself from Jūtarō, even as he continues to help the young man as best he can. When Akemi, Jūtarō’s love interest, is killed–a gruesome moment in the text I will deal with at greater length–Jūtarō assumes Kagemaru is responsible, since it happens in the midst of one of the Kage ichizoku‘s attacks. Because of the layers and layers of deceit Kagemaru builds up around himself, Jūtarō is instrumental in hunting him down, but, when Jūtarō confronts him with his responsibility for Akemi’s death, Kagemaru reveals to him, something the reader has known for quite some time, that Akemi is his sister–how could he be responsible? He isn’t, in fact, and Jūtarō is crushed by the realization that he has lost everything dear to him, even his revenge. What seems at first to be such an easy allegory is undermined by NB‘s valorization not of class struggle but the liminal figures dispossessed by a rigid caste system and yet still subservient to it. No one, properly speaking, is the hero of NB, even though the title bears Kagemaru’s name. It has many anti-heros, or those whose personal struggle is never simple. The only real villain is Nobunaga, whose ambitious project to “unify” Japan is ultimately responsible for making everyone miserable. Next week: Hotarubi and Akemi, two of the most fascinating women in any work of literature. I’m sorry if i look dumb but ….where can I get this manga? Not a dumb question at all! If you’re looking for NB in translation, then I cannot suggest anything, since no translation, as far as I know, exists. If it’s the Japanese text you’re looking for, I would suggest using honto.jp, since their international shipping is the most reasonable.